Arnos Vale Cemetery Trust, Bristol, looks after a natural conservation area and and heritage site with 31 Grade II listed buildings and monuments. My work as Development Manager was to maximise the opportunity of the Heritage Lottery Fund's 'catalyst' matchfunding during the last 12 months of its 4-year pledge. Twice the amount of the previous three years' average funds were raised during my one-year, part-time contract. With barely any resource the fundraising campaign hadn't been well communicated. The Heritage Lottery Fund (HLF) programme is called the Catalyst Endowment Challenge – this name meant little to the target audience, and 'endowment' has a negative connotation to anyone who remembers mortgage mis-selling. The CEO suggested a logo incorporating the organisation's existing logo that also indicated the time-limit on the challenge. "For a Lifetime" was chosen to rebrand the appeal – the more that could be raised for the charity's endowment fund the more it could ensure the site would remain open in perpetuity. The on-site communication, when I started work, gave a confusing message: misleading banner headlines began "£500,000 has been awarded..." before clarifying that this money was a matchfunding pledge reliant on AVCT raising the same amount. I created on-site messaging to position the cemetery as a valuable, inclusive and welcoming community resource (donors are more motivated to give to people more than to things!) – much of the original appeal focused on the Cemetery's earlier rescue and restoration need. These posters appeared on-site at the same time as new signage that included a suggested donation to enter the free site. Donations in the on-site donation boxes increased by 30% in the first two months. One donor, who gave £1,000 to the appeal, said she had done so as a response to the A1 posters shown above (which were displayed near the café). To thank her, I invited her to a 'breakfast bacon-butty tour' – she later encouraged two of her siblings to donate a total of £1,500. Arnos Vale Cemetery Trust had been born out of a resolute community campaign to save and restore dilapidated historic site which was re-opened to the public in 2010. Arnos Vale was developing its business model and community relationships, yet its local importance had not been recognised in AVCT's case-for-support communications, which still concentrated on the original campaign slogan "saved but not safe". The cemetery is: heritage, architecture, history, education, nature conservation, local park, café, arts venue, working cemetery, wedding venue and activities for children and the community. The common thread was the people to whom the site had meaning. 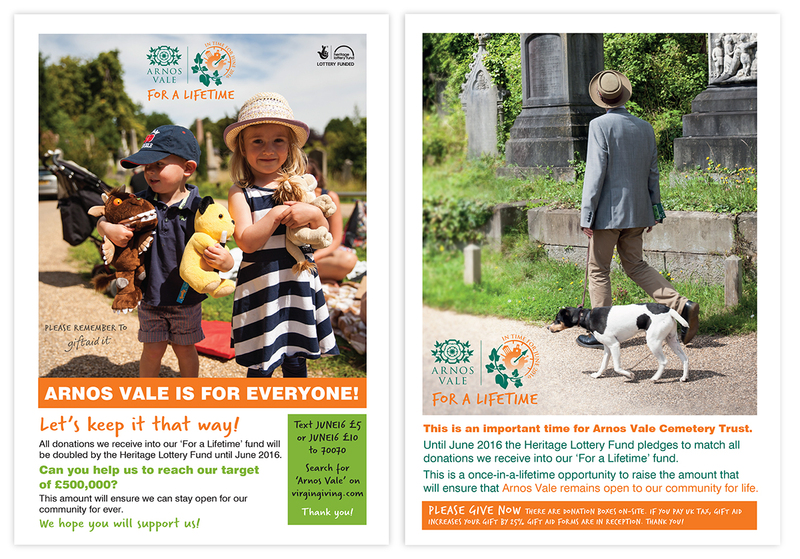 With Arnos Vale situated in a deprived ward, I put them at the centre of our funding applications, and case-for-support brochures, using more engaging language; emotive images and infographics to tell the story. A double page spread from an application to a grantmaking gives quantitative visitor information, emphasised by the inforgraphic, lists achievements (funders often look favourably on organisations who are working to help themselves) and illustrates community engagement. The Cemetery safeguards a memorial to the 'father of modern India' Rajah Rammohun Roy. This case-for-support document was written to build awareness within the Indian community, and historians. Copies were sent to the Indian High Commissioner who after his visit to attend the annual commemoration ceremony. A donation of £3,500 was received from a prominent British-Indian businessman to whom the document was sent. A 'gala' event toward the end of the four-year appeal had been planned long before I joined AVCT, orginally envisaged as a top-notch, formal event for the 'great and the good' of Bristol, and costed at £21,000. Working closely with philanthropist and supporter, Lindsay Telling, we re-worked the event into an informal showcase of the Trust's community connections for a cost of £1,600, with sponsorship from local and national businesses and entertainers performing free of charge. The evening raised £7,500 after costs, doubled to £15,000 by the HLF. The event was strongly branded, and the event dressing was low-key (simple flowers in jam jars, dessert was chocolate brownies made by volunteers). The invitation, above, attracted over 70 guests including Bristol's Mayor, Lord Mayor and High Sheriff. We received excellent feedback on the event and followed it up with invitations to a 'breakfast bacon butty tour' of the site. The two tours elicited a further £2,250 in donations. A little research into one guest's family allowed us to find her ancestors' plot and include it on the tour: she gave a generous amount and has promised to introduce her family and keep in touch with AVCT. The tours also brought about interest from potential 'ambassadors' keen to be involved in fundraising and development activities and a connection to a valuable network of landscape volunteers. I worked with stand-up comedian and TV warm-up artist Mark Olver to put on two comedy fundraiser gigs in Arnos Vale's 100-seater Anglican Chapel. Well-connected in the comedy world, Mark was able to ask Dr Phil Hammond and Stuart Goldsmith to perform free-of charge. 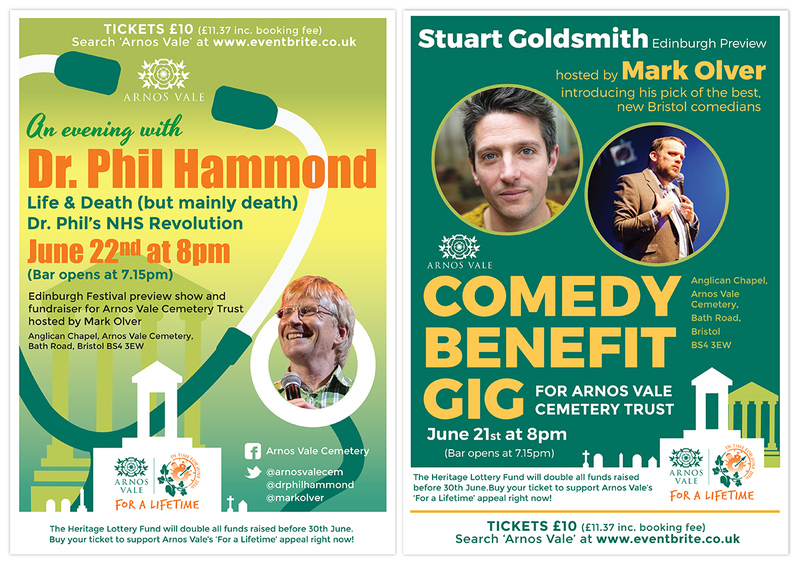 We have since talked about an annual comedy festival to raise funds and help put Arnos Vale 'on the map'. The two nights raised £2,500 (£5,000 HLF-matchfunded) from ticket sales, a bucket collection and the bar which was run by the ever-supportive Friends of Arnos Vale Cemetery. Importantly the events engaged a new audience: attendees included guests who had been introduced to AVCT through April's Spring Eternal event; postcode analysis showed a large number were drawn from outside AV's usual, local area of support. A quick show of hands at Dr Phil's gig showed that around 5% of the audience had come primarily to support Arnos Vale's fundraising efforts, and that 25–30% had never before visited the site. This was the final fundraising effort of the four-year campaign, my one-year contract ended in July 2016. 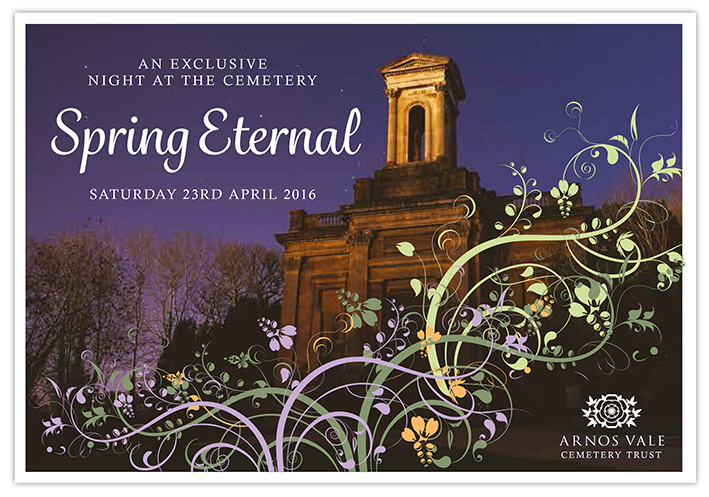 Arnos Vale Cemetery Trust raised £297,205 (doubled to £594,410). Fundraising efforts gained impetus in the final two months of the campaign. In May, I posted a stories about donations made with the donor's motivations. In June I ran a social media campaign on Facebook and Twitter. With 'Cemetery Trust' added to the standard logo to emphasise charitable status, I created a series of 12 facts about AVCT's status, social enterprise activities, gratitude to our volunteers and supporters, need for fundraising and 'the ask', signposted to our Virgin Money donation page – the results show increased donations and engagement.